The best way to explore unscathed beauty is by sailing in luxury yachts in Mykonos. With over 200 islands forming the Cyclades group in the Aegean Sea, Mykonos is the heart of this cluster. A cruise to the Mediterranean is best completed by sailing through the islands around Mykonos with a chartered catamaran, sailboat or motorboat. Availability of skippered, crewed and bareboat services further help in customising your cruising trip – How? A typical climate of the Med with sunny days and mild temperatures while cruising on luxury yachts in Mykonos make for a perfect atmosphere to contemplate in silence. If you are a luxury seeking soul, charter a crewed catamaran. It comprises the services of a steward, seasoned chefs, and a bunch of professionals to assist, along with the expertise of a veteran captain. However, if you seek adventure in these waters, hire a bareboat catamaran and take charge of sailing. Only make sure to have your sailing license ready, a safety mandate from our end. Available in different capacities, motorboats can speed up to 50 knots at their highest. The small ones are suitable for a day’s cruising while you will have to charter the bigger ones for a week-long sojourn. The length may extend up to 70 feet depending on their capacity to accommodate people. 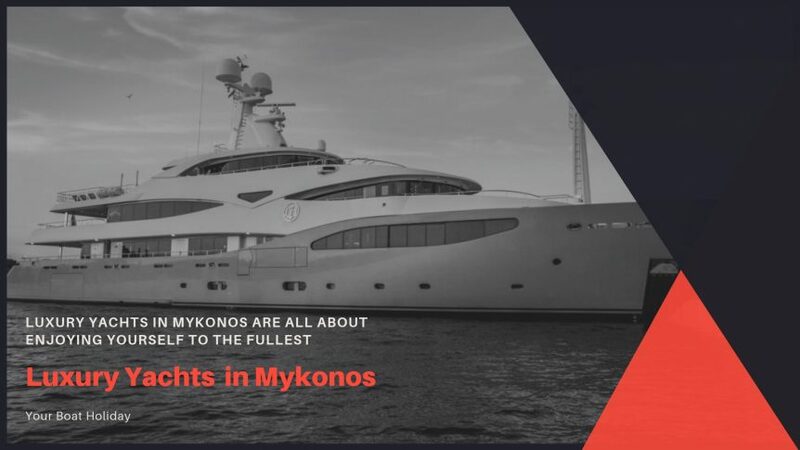 These luxury yachts in Mykonos yachts are suitable for the Mediterranean waters because there are many destinations that you must visit in a week or so. Additionally, numerous ancient monuments and archaeological sites in the Cyclades should also be on your must-visit list when sailing in Mykonos. You can also go for skippered sailboats. It will have a veteran captain accompanying you to ensure smooth navigation and safety while you bask and munch on some delicious Mediterranean cuisines with your loved ones. Propelled entirely by the sails and masts, a sailboat brings lavishness and nobility together in one vessel. Accompanied by the stunning aquamarine view of the Med, these yachts offer a languid sail compelling you to drop all thoughts and relax. Flawless masts ruffling against blowing winds at over 20 knots here give an enigmatic view. And when you get to change the sails yourself by turning its wheels and watch the masts cut through these winds while your vessel changes direction, it gets more satisfying than anything else. Get ready to set sail in this spectacular place! Mykonos is one of the most renowned places in Greece for its picturesque architecture and white-washed buildings clinging to the hillside. Sailing in Mykonos and the surrounding Cycladic Islands is worth a luxury cruising if you love romancing the idea of the ancient world. You can sit and relax during evening hours to watch the sanguine sun going down the horizon. You don’t need a better reason to book cruising vessels in Mykonos as this place does come with innumerable possibilities!